MEET Divyesh Bhandari, the 21-year-old Bangalorean whose theatre company Imbroglio Productions is working with international charity, World Peace Flame Foundation, to organise a series of events for young people. Bringing inner peace into individual lives, the aim is to promote the cause city wide, in a programme that culminates in January. Tell us about the World Peace Flame Foundation. 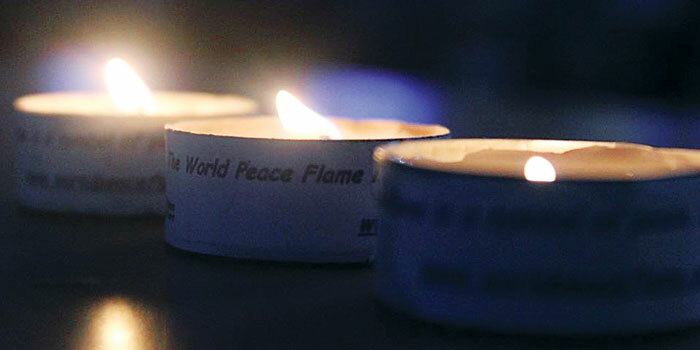 Their aim is to light a World Peace Flame in every major city worldwide, as a symbol of peace and freedom. I came into contact with them while I was in Leeds, UK, studying for my Masters. They were looking for someone to help them take the peace flame to India, and with my experience working with young people as part of my theatre group, Imbroglio Productions, I wanted to help. Wea��re delivering practical workshops to students of 16 schools on achieving peace. Ita��s a programme thata��s popular in the UK, Netherlands and Australia, focusing on a�?just a minutea�� meditation. The schools are getting creative with ways to give back to the community and raise awareness. Students from Bishop Cotton organised a flash mob at Orion Mall, next month 400 students will run a marathon for peace, and youngsters are selling newspapers to buy medicine for AIDS-affected kids. Ia��ve seen the impact that our simple meditation techniques and drama workshops have on young people who are struggling with exam stress and peer pressure. For the last year and a half, Ia��ve given over an hour every morning to meditate, and it has made a great difference. I would never have believed that I could handle such a huge project as this, but Ia��m more relaxed than I have ever been. What can we watch out for? The grand finale will be a show performed by the 16 schools to an audience of over 4,000 in January 2015 at the UB City Amphitheatre. Afterwards, the World Peace Flame will be lit for the first time in India, before moving to its permanent home as part of a monument that is being built at Sarala Birla Academy.